ORIGINAL DIGITAL ART ON THE BITCOIN BLOCKCHAIN WITH CERTIFICATE OF OWNERSHIP AND AUTHENTICITY! As part of the transaction I will transfer the Verisart registration to you so the chain of ownership is updated. In less than 24 hours, upon purchase, I will start the transfer of ownership process to your e-mail. After your registration, you can download your Certificate of Ownership and Authenticity with your edition number directly to Verisart's website. You're purchasing the full -----Non-Commercial! ----- ownership rights to this creation. You may print any of the files as many times as you wish, this is limited to personal use only. But just like a print, the copyright and Intellectual property remains property of the artist. NOTE: You only have the right to resell each artwork only once, together with transfer of Verisart ownership registration. No physical product will be shipped and the frame is not included. ⦁ 1. Original files in high resolution, 300 DPI for print. ⦁ 2. Small resolution file to share on the internet, not to print. ⦁ 3. PDF print instructions file. ⦁ 4. Copy of the original Certificate of Authenticity (without edition number), in the download session of Etsy. (PDF). ⦁ 5. Your unique Certificate of Ownership and Authenticity (transfer pending) with your edition number through Verisart. Included are: 5 high-resolution JPG files, 1 PDF print instructions file and 1 small resolution JPG file for web. With these files, you can print over 30 different sizes, up to a maximum size of 24x36” (60x90cm) or square 24x24” (60x60cm) in 300 DPI. INCHES: 4x 6” , 6x 9", 8x12”, 10x15", 12x18”, 16x24”, 20x30”, 24x36”. CENTIMETERS: 10x15cm, 20x30cm, 30x45cm, 40x60cm, 50x75cm, 60x90cm (IKEA 61x 91cm). INCHES: 6x8”, 9x12”, 12x16”, 15x20”, 18x24”, 21x28”, 24x32”. CENTIMETERS: 15x20cm, 30x40cm (IKEA), 45x60cm, 60x80cm. INCHES: 4x 5”, 8x10”, 11x14”, 12x15”, 16x20”, 19x 24”, 24x 30”. CENTIMETERS: 10x12,5cm, 20x25cm, 28x35cm, 30x37,5cm, 40x50cm (IKEA ), 48x60cm, 60x75cm. INCHES: 24x24”, 20x20”, 16x16”, 12x12”, 10x10”, 8x8”. CENTIMETERS: 60x60cm, 50x50cm, 40x40cm, 30x30cm, 25x25cm, 20x20cm. For best results select "Best Quality" option in the Print dialog, and use photographic paper. Colours may vary between viewing on your monitor or phone and your actual printed product as all monitors and screens display colour differently. For best results, ask for canvas print, matte photo paper or photographic archival ink print and a reputable local high quality printer, or any well known online printing service. 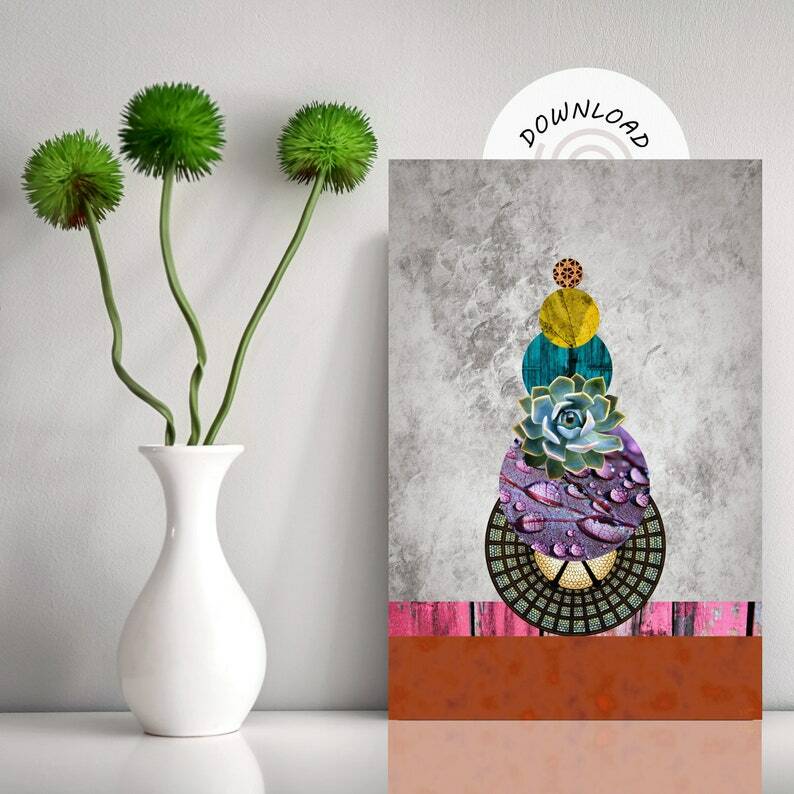 Upon purchase, you'll be given the right to use, display (small size for internet),print, resell and transfer the creation for non-commercial purposes only. Since you own this unique creation, with the guarantee of a certificate of authenticity at Blockchain with your edition number, you can also resell the creation on a secondary market (non Etsy), always along with the transfer of ownership certificate. Files isolated without transfer of ownership registration can never be resold! For each certificate issued by the artist you have the right to a resale. If you wish to resell all limited editions of the work exclusively, you must purchase all limited editions and you will receive all Verisart Certificates from the Artwork (90 limited editions = 90 Certificates), so you can resell the work exclusively and always associated with the artist's name. Do NOT claim this piece of art as your own. You being a gallery or Art dealer will get a discount, please contact me! Patchwork Energy Flower, Digital Art Collage INSTANT DOWNLOAD with Certificate of Authenticity, SIZE 60x90cm. Abstract Flowers Illustration, Digital Art Collage INSTANT DOWNLOAD with Certificate of Authenticity, SIZE 60x90cm. Space Clearing Flowers, Abstract Digital Art Collage INSTANT DOWNLOAD with Certificate of Authenticity, SIZE 60x90cm. 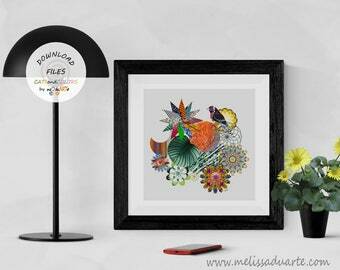 Abstract Mandalas with Bird, Digital Art Illustration INSTANT DOWNLOAD with Certificate of Authenticity, SIZE 60x60cm. 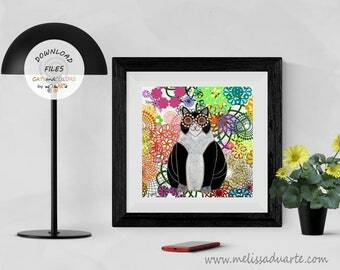 Lala, Cat Digital Art Illustration INSTANT DOWNLOAD with Certificate of Authenticity, SIZE 60x60cm. Printing - What paper should I use? How do I get my files? Digital files are available automatically after purchase at http://www.etsy.com/your/purchases (or, if you check out with a guest account, your download links will be sent to your e-mail address - check your junk/spam/promotions folder). Please note that downloads are not currently available in the Etsy app - you'll need to open that link in your device's browser. Please check your email (including junk/spam folders) for your purchase receipt from Etsy. Can I sell your work? Upon purchase, you'll be given the right to resell and transfer the creation for non-commercial purposes. Since you own this unique creation, with the guarantee of a certificate of authenticity at Blockchain with your edition number, you can also resell the creation on a secondary market (non Etsy). Files isolated without transfer of ownership registration can never be resold! For each certificate issued by the artist you have the right to a resale. If you wish to resell all limited editions of the work exclusively, you must purchase all limited editions and you will receive all Verisart Certificates from the Artwork, so you can resell the work exclusively and always associated with the artist's name. Please contact me for discounts. By purchasing this artwork you are agreeing and respecting the copyright agreement. Do NOT claim this piece of art as your own. Do NOT distribute or publish these files (digital or printed). Do NOT use this artwork for commercial purposes. Do NOT share these files. The copyright and Intellectual property remains property of the artist. If you wish to use the artwork for commercial purposes, please get in touch with me. Sea of Life, Abstract Collage Digital Art INSTANT DOWNLOAD with Certificate of Authenticity on the Bitcoin Blockchain, SIZE 60x90cm.